Set on a pristine property, Cheerio offers enthusiatic fly fishermen 3 dams to cast their flies in. This is stricly fly fishing only, which means no bait or spinners allowed. The resort offers beginner rods for rental, as well as a stock of flies for purchase. 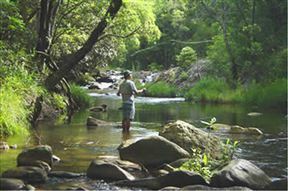 Cheerio Trout Fishing is 5.3km from the centre of Haenertsburg , the nearest airport 55.3km (Polokwane Airport).